Year after year, over 700,000 visitors flock to Washington DC to experience the city's exciting National Cherry Blossom Festival. This year come and experience it for yourself! Year after year, over 700,000 visitors flock to Washington DC to experience the city's exciting National Cherry Blossom Festival. This two-week springtime event begins on the last Saturday in March, and is filled with cultural celebrations throughout the city, including art exhibits, sporting events, all kinds of performances, entertainment, tours and so much more. The festival has an intriguing history dating back to 1912, when Japan gifted 3,000 Japanese cherry blossom trees to the United States. These trees can now be seen along the city's Tidal Basin, a huge attraction for innumerable tourists each and every spring. Cherry blossom trees can also be seen at other Washington DC attractions, including the Martin Luther King Jr. Memorial. Kick off the opening Saturday of the National Cherry Blossom Festival with fun activities at Family Day, where kids can learn and play with arts and crafts, performances, classes and more. The festival's second Saturday finds thousands of spectators at the National Cherry Blossom Festival Parade on Constitution Avenue. Held on the same day as the parade, the Sakura Matsuri street festival lines up along several blocks of Pennsylvania Avenue. It features colorful displays of Japanese culture, with performances, martial arts, vendors, artwork and a variety of food. You'll also find intriguing exhibits along with fun arts and crafts workshops. Among the festival's most popular family activities is the Blossom Kite Festival, with professional kiters performing demos and kite-making workshops. The Southwest Waterfront Fireworks Festival is also a main highlight of the National Cherry Blossom Festival, with all-day entertainment, live performances, water sports and a breathtaking fireworks display. Visitors can also participate in festival events like the Cherry Blossom 10-Mile Run and the ceremonial lighting of the ancient Japanese lantern. The new Cherry Blast is a great way to see the best of Washington DC nightlife; this underground-style concert event is filled with DJs, local musicians, dance and art. In addition to the highlighted events, you can also experience a variety of smaller activities every day of the festival. It's the perfect opportunity to try incredible Japanese cuisine at Washington DC restaurants, or you can have a blast at the festival's sushi and sake celebrations. Local museums and galleries offer jaw-dropping Japanese art exhibits throughout the festival. During your trip, make sure to experience the city's 3,000 cherry blossom trees first-hand at the Tidal Basin, where you can enjoy bike tours, paddleboats, cruises along the Potomac and guided tours, or with a leisurely stroll along the water's edge. You'll fall in love with the soft pink and white tones of one of Washington DC's most beloved treasures: the Japanese cherry blossom tree. 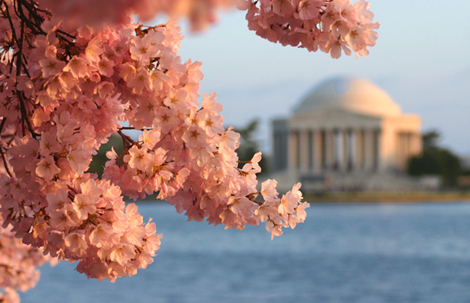 Celebrate history with endless cultural events and family activities throughout the National Cherry Blossom Festival.